While some believe that it is the level (or stock) of the 10Y yield during a rate rout that determines the resulting revulsion toward equities, while others claim that it it speed of the sell off (the "flow" angle) that matters, the reality is that the higher rates rise - whether fast or slow - the less attractive risk assets become (in a recent analysis, Bank of America calculated what the great un-rotation "magic number" is for yields). And while violent interest rate repricings certainly have an impact on risk assets - if only over the short-term, until rate vol normalizes - as today's market action confirms, a more comprehensive theory suggests that the US dollar (the world's reserve currency) and US interest-rates (world's risk-free-rate) cycle play a vital role in determining changes in asset prices and the global economy, especially after the gold standard was abolished in 1971. 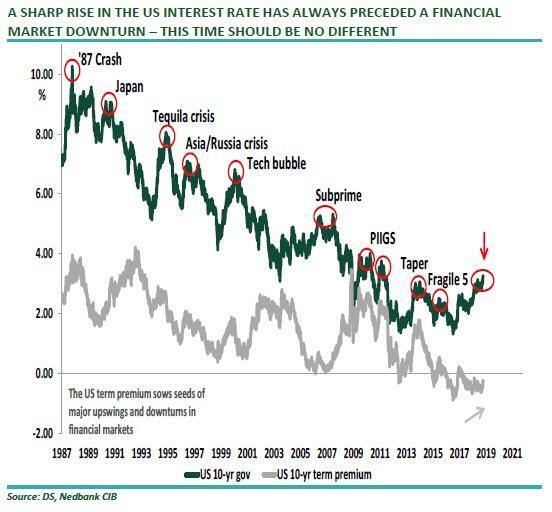 In a new note from Nedbank's Neels Heyneke and Mehul Daya, the strategists explain why they believe "we are approaching historical thresholds", where tighter monetary conditions in the US have traditionally been the "straw that breaks the camel's back" for the equity market and economic growth, and why "this time should be no different." To begin, Nedbank defines US real interest rate as the spread between the US 10-year bond yield and the natural rate of interest (r*). The Laubach-Williams r* estimate is basically the real short-term interest rate at which the US economy is at equilibrium, i.e., where unemployment and inflation are at the 2% target. This allows to determination of monetary conditions in the US relative to the underlying economy. Historically, US real interest rates have been an accurate indicator for measuring monetary conditions and gauging turning points in the financial and economic cycle. During the "Volker era", US real interest rates rose steadily and ranged from 4-10%. However, from the late 1990s, it has become evident that central banks would bail out the financial system (Greenspan/Bernanke put) and, as a result, US real interest rates have ranged from 1-3%. Since the late 1990s, it has also been quite evident that when US real interest rates rise to the upper band of the 1-3% range, monetary conditions become too tight, leading to a liquidity crunch in financial markets, marking the end of the economic cycle. Since the late 1980s, it has been evident that a strong relationship exists between the US real interest rate and the US 10yr/S&P 500 correlation, which has been mainly positive, i.e., interest rates rise and the S&P 500 rallies, and vice versa. 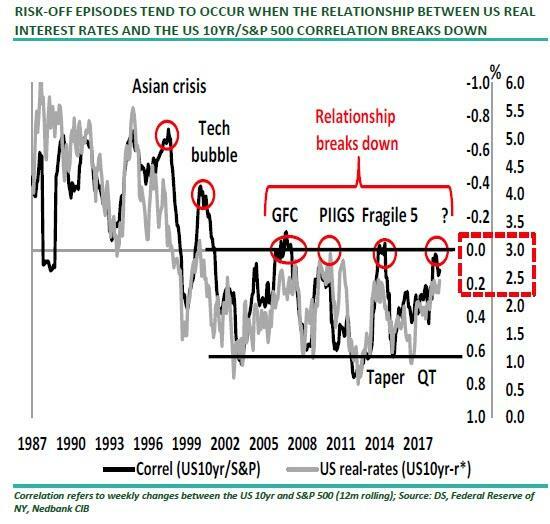 However, there have been a number of instances when this relationship has 'broken down', resulting in major risk-off periods - the Asian crisis, the tech bubble, the GFC, the PIIGS crisis, the 'taper tantrum' and the Fragile 5 crisis. These severe bouts of risk-off episodes occurred mainly because monetary conditions became too tight. As monetary conditions tighten, the relationship between US real interest rates and the US 10yr/S&P 500 correlation moves from positive to less positive/negative, i.e., interest rates rise, but the S&P 500 starts to fall. 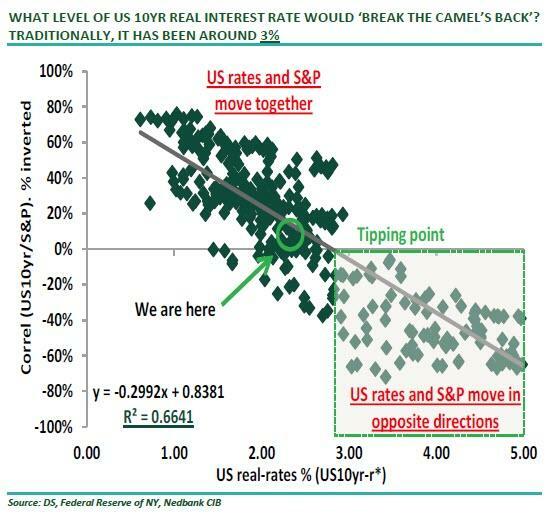 Because in their latest note, the Nedbank analysts have calculated that the approximate range of US real interest rates that they believe will be "the straw that breaks the camel's back." Specifically, the "tipping point" at which the relationship between US real interest rates and the S&P 500 moves from being positive to negative (the risk-off phase) is when US real interest rates rise to 2.70-3.00%, as reflected in the scatter plot. The US real interest rate is currently at 2.64%, just 6 bps away from the lower bound of this "crisis zone." And while US economic growth has been supported by the expansionary fiscal package, when this effect starts to lose momentum, the natural rate (r*) is unlikely to rise at the same speed as the US 10yr rate. Therefore, Nedbank believes the real interest rate will likely rise; this would be the 'tipping point' for financial markets. 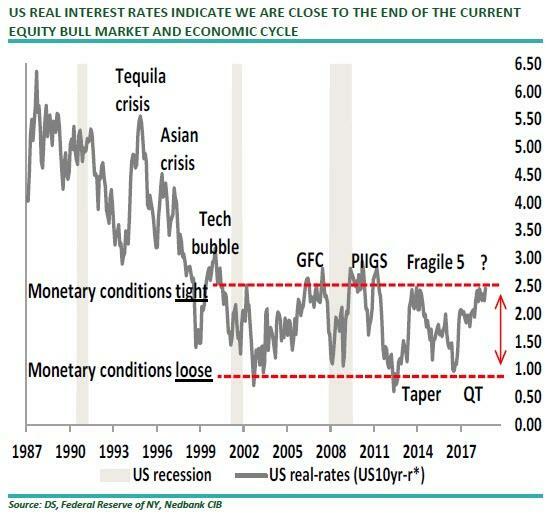 Monetary conditions are too tight, and we are close to the 'tipping point', where higher US real interest rates begin to hurt equity prices and growth. US corporations are highly leveraged, and rising real interest rates will be damaging to their balance sheets. According to Heyneke and Daya, as the chart below shows, after the sell-off in January 2018, the S&P 500 worked higher in a rising wedge. This rally completed the Elliott wave count since the 2009 low, and the MACD failed to confirm the new high, confirming the loss of momentum. The market has subsequently broken down out of the 2018 bull trend, targeting the bottom of the bull channel at 2,553. The general rule in Elliott wave analysis is that on completion of a five-wave structure, the market tends to correct the fifth wave, which targets a correction to 1,821. This level is also a 50% retracement of the bull trend since the GFC. As Nedbank further notes, the risk-off phase since the start of the year is currently finding support at 1,906. The next risk-off phase projects a move to 1,612. A break below the latter targets a move to the low from 2010-12 of 1,328; this would materialise only if the S&P 500 breaks below 2,553. 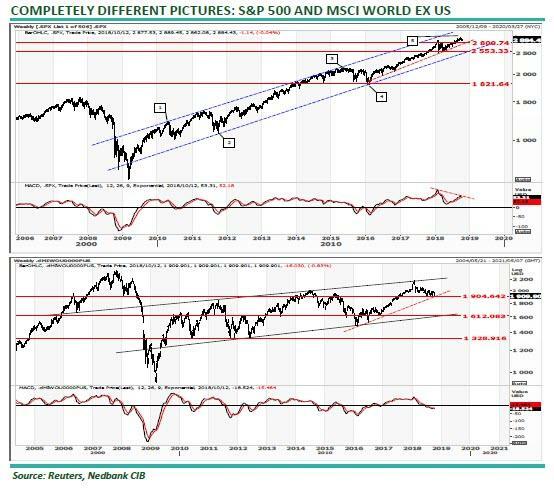 If our fundamental work above materialises the downside potential for the S&P 500, MSCI World ex US and JSE (Weighted All-Share index) is a correction in the range of 20-30% from current levels. There is some hope yet for the bulls: one week ago, Dennis Gartman declared that "A Global Bear Market Of Some Very Real Consequence Is Developing." Maybe algos just haven't gotten the memo yet.